STAY A LITTLE LONGER is southern small-town romance at its best. Athena’s journey is one that will stick with you long after the last page is turned. Don’t miss your chance to fall in love with the colorful cast of characters of the Misfit Inn in Eden’s Ridge, Tennessee. Athena Reynolds is a goddess in the kitchen, and she’s got her Michelin-starred restaurant Olympus to back it up. Darling of the Chicago restaurant scene, she’s flying high—until a betrayal leads to her sudden fall from grace. Furious and reeling, she heads home to the solace of family in Tennessee. Logan Maxwell has his hands full keeping his organic farm thriving and in the black. He doesn’t have time to do more than wonder about the prickly mystery that is Athena Reynolds and relive their one passionate night together. Her life is in Chicago and his is irrevocably tied to his land. But that hasn’t stopped him from craving more. But small towns are like small kitchens, everyone's constantly bumping into each other and sooner or later something's bound to boil over. Maybe that's why Logan finds it so hard to resist Athena. Well, that and the fact that he's never been able to walk away from a woman in distress. An unexpected confidant, Logan reminds Athena of her roots, and in turn, she begins to question everything she’s spent years working for. They just might hold the keys to each other’s salvation—but when her old life comes calling, can love win out over the temptation of redemption? Q: What makes the Misfit Inn series special? The Misfit Inn is a quartet of southern romance novels focused on the family saga of the Reynolds sisters and the loves they find along the way, as they come back together as a family after the death of their mother, proving that the family you make is stronger than the one you're born into. Just like my Wishful series, The Misfit Inn quartet is intended to highlight everything that I love about living in the small town South--all the quirks, foibles, and dreams that provide a fabulous backdrop to contemporary romances about stubborn, independent women and the men who love them. Q: Who would dig these books? The Misfit Inn is a southern romance series written for anyone looking for family saga romance, where you get to follow the loves of each member of a generation. This quartet explores the relationships between sisters and what the bonds of family truly mean. Many of my readers also enjoy the books of Susan Elizabeth Phillips, Kristan Higgins, Melanie Shawn, Ava Miles, and Jill Shalvis. Athena and Logan are such a great couple. We get a look into why Athena is the way she is - kind of prickly IMO - I should say was because now she is adorable but still Athena. Logan is such a great guy and I loved how he loved Athena in the way she needed to be loved. The author made me feel the emotions that the characters were going through. A definite page turner and I can&#039;t wait for the next book in this series. I received a free copy of this book via Booksprout and am voluntarily leaving a review. ARC for honest review with no compensation 4.5 stars Stay a Little Longer is book 3 in the Misfit Inn series by Karl Nolan and a great addition to this series! This story is about Athena Reynolds a world renowned chef, who after catching her boyfriend in a very compromising position in their Michelin Star restaurant in Chicago, she has a meltdown that ends up on you tube..so not good...so she heads back home to Tennessee to figure out what is next for her life...helping her “sisters” in the Misfit Inn and reconnecting with Logan Maxwell her one night stand or leaving again to start over somewhere else... Logan Maxwell, owner of the up and growing organic farm has feelings for Athena since their one night of passion but knowing she belongs in Chicago at her restaurant he hasn’t pursued her...that is until he runs into her suddenly at the Misfit Inn and wonders why has she returned home? What happens next is swoon worthy, has secrets, lots of sparks, laughter, tears and rooting for this couple to find their way to a HEA!! Athena and Logan, a chef and a farmer.....what a perfect match! I love Athena, shes hard and tough on the outside but only a rare few get to see the real Athena, soft on the inside. Athena and Logan just click, from a one night stand a year ago neither lost those feelings for the other. When back in the same town once again things heated up a bit more. Top Michelin Star Chef moves back home and needs a new career focus so who better to team up with than Logan the farm to plate farmer. These two make a great couple at work and at home. Athena and Logan are perfect together, and manage to unite in a wonderful life. Great connection....very hard to put down. Kait Nolan books are great to curl up to and to just enjoy reading. Stay a Little Longer is a Misfit Inn story of Athena Reynolds a chef and part owner of the Misfit Inn. When she was home the year before from Chicago for her sisters wedding she has a fling with Logan Maxwell, an organic farmer. Now she is home from Chicago hiding from an embarrassing video that went viral and to reacess her career and life. The attraction Logan feels for Athena is still present but he knows she distrust and runs scared. Kait Nolan has the ability to write a beautiful story that you become emotionally involved with the the characters. 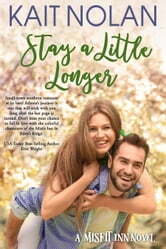 I highly recommend reading Stay a Little Longer. I received a free copy of this book via Booksprout and am voluntarily leaving a review.